If you’re shopping for a pool cover, you’ve come to the right place. PcPools.com has pool covers for every swimming pool, every need, and every season. Whether you have a new pool or want to take care of an existing pool, owning a swimming pool means needing a pool cover. 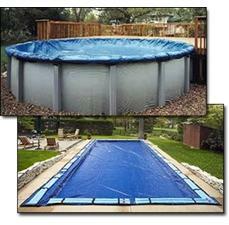 A cover from PcPools.com will offer the best protection that you can get at a very economical price. Whether it’s a solar pool cover, a winter pool cover, or a safety pool cover, we offer pool owners standard and custom solutions paired with expert advice to ensure you choose and receive the right pool cover. We offer Arctic Armor Winter Pool Covers, Arctic Armor Safety Pool Covers, and Magni-Clear solar pool covers. All are manufactured with high standards, so browse our entire selection comfortably. 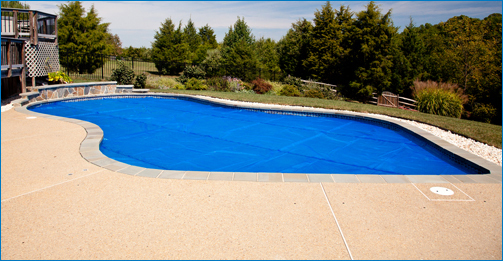 If you have questions, email us at customerservice@pcpools.com for expert advice. Winter Pool Covers: Winter pool covers are designed to keep your swimming pool clean after the swimming season is over. Artic Armor manufactures them for both in ground pools and above ground pools, enabling all PcPools.com customers to find a winter pool cover in the variety they need. They come in a variety of thicknesses with a variety of corresponding manufacturer’s warranties, ranging from 8 to 20 years. All of our varieties, however, are constructed out of a tightly woven polyethylene fabric designed to withstand harsh winter weather, prevent algae growth, and save you time and money by eliminating cleaning time in the Spring. Regardless of the size or shape of your swimming pool—whether in ground or above ground—we offer the cover that fits your pool, or we can help you create a custom-made cover to your exact specifications. Solar Pool Covers: Available in 8, 12, and 14 mil thickness—in either standard blue or our Premier Magni-Clear style—PcPools’ solar pool covers are manufactured to maximize their heating and insulation properties. 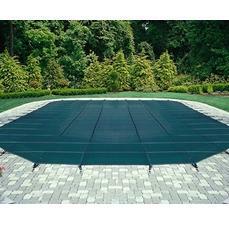 Whether you have an above ground pool or an in ground pool, using a quality solar pool cover saves you money. This is because the cover, floating freely on top of the pool water, functions as a blanket and heater: the "see through" design allows sun rays into the water to add heat, and the air bubbles (which resemble bubble-wrap) then retain existing heat by insulating the water’s surface. The cover also helps prevent evaporation (which accounts for upward of 70 percent of the heat loss from your pool) and shields your swimming pool from cool nighttime air and winds. Whether or not you have a separate pool heater or heating system, a solar pool cover is a must have for any swimming pool owner. Note, however, that it is important to use a solar pool cover that meets your swimming pool’s size specifications. If not, the potential heat production and heat retention benefits will be diminished. Safety Pool Covers. It’s impossible for even the most diligent swimming pool owner to watch over his or her pool at all times. Fencing, locks, and alarms help, but a safety pool cover gives you the peace of mind of knowing that accidents won’t happen when you’re not home. These pool covers, anchored to the ground around in ground swimming pools, are a must for families with small children, elderly parents, or pets. Available in a variety of colors, thicknesses, and styles (mesh or solid)—with warranties of 12 or 15 years—a safety pool cover can help prevent unwanted incidents. Plus, they make keeping your in ground pool clean much easier by blocking out unwanted debris. Extremely popular and highly rated, our Artic Armor Safety Pool Covers are available in standard and custom sizes.